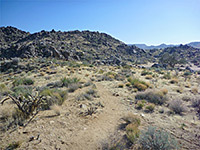 Created quite recently (2009), the Rock Spring Loop is one of only eight maintained paths in Mojave National Preserve, though off-trail hiking is of course virtually limitless. 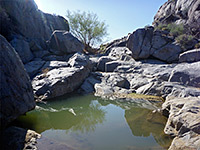 The trail visits a short section of narrow, boulder-filled canyon enclosed by low granite cliffs, site of a year-round spring and some seasonal pools. 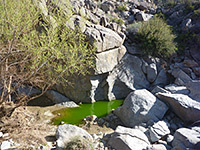 The best aspect is the contrast between the dark waters - often rich green due to algae - and the smooth, grey granite surroundings; also of interest are the abundant desert vegetation, the long-distance views of the nearby hills and plains, and a historic stone house at the trailhead. 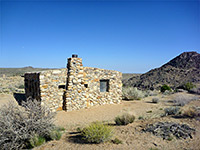 This small dwelling (Rock House) was constructed in 1929 by WW1 veteran Bert Smith, built on a little hill with views over the canyon; he lived in this remote place for 25 years. The signed trailhead for the Rock Spring hike is at the end of a narrow, 0.2 mile track forking off Cedar Canyon Road 11 miles east of the junction with Kelso-Cima Road and 14 miles from Hole-in-the-Wall campground. The track ends at a circular parking area with rest rooms, information board and the stone cabin, from where the well-used path crosses a grassy ridge to a viewpoint of the upper, shallow end of the canyon, filled with rounded granite boulders, beneath slightly higher cliffs to the south. It looks easy to follow the wash downstream, but the trail turns away, running down a small ravine to the base of the narrows, below which the drainage abruptly changes to a wide sandy wash. The spring lies just upstream and can produce flowing water during rainy periods though for much of the year it is just a muddy pool, not very appealing. 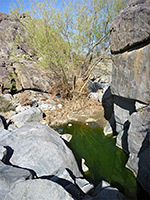 Walking upcanyon over the boulders leads to several other, prettier pools, one of which may hold cloudy, emerald green water at the foot of a sheer grey cliff. The drainage contains some big piles of driftwood, caught behind cottonwood trees, evidence of the huge flash floods that occasionally rush through the canyon. 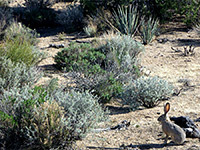 The return section of the loop is a little longer, over rolling shortgrass hills dotted with occasional juniper and pinyon pine, encountering several types of desert plants including cholla, yucca and echinocereus.